Last Sunday the Troubles had to make a short trip to Tokyo and as always were found procrastinating to the very last minute. First, there was this house business to take care of, with bamboo stalks, offerings of salt, dried fish flakes, fruit and veggies, a whole frozen fish, and of course - sake. Then yours truly thought it would be a grand idea to go to Toys R Us to buy some xmas cards. Ha! Toys R Us! At 10AM on a Sunday morning! 2 weeks before xmas! Yes, clearly an emergency brain scan is in order here. After that ordeal, a total decontamination was necessary, and by the time we were all set and ready to leave for Tokyo it was already around 2PM. That meant all our plans to go to Roppongi and see the views from that building went nowhere. Instead we found ourselves in Matsuya in Asakusa eating vile, but cheap food. The rice was awful, but then again what can you expect from a 540 yen meal set? Though in my defense, Matsuya in Utsunomiya is not THAT awful. Cheap, and perfectly edible. Mister grumbled something about rice being much better in the countryside, and I annoyed the workers by drinking my own beverages purchased elsewhere. By the way, this Starbucks Chocolate Eclair coffee is delicious. 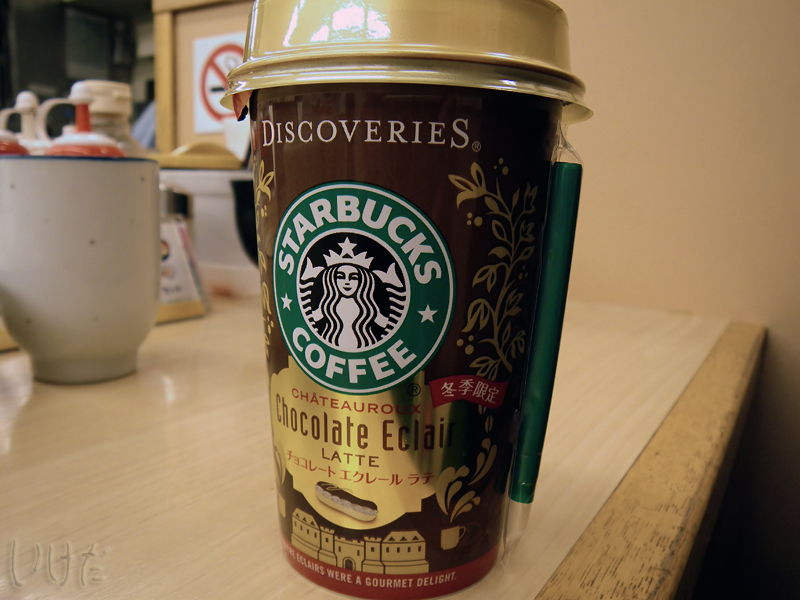 Doesn't taste anything like an eclair, but then again, it all depends on what kind of eclairs you like, I suppose. Then came Shibuya, where at Tokyu department store I had a nervous breakdown and demanded to leave this horrid city ASAP. It's no secret that I don't like Tokyo. And every time I visit this city, I only dislike it more and more. Why? The people. Sorry, if any of you native Tokyoites are reading this, but 99% of you are mindless sheeple, who when faced with an obstacle on the sidewalk, just stop and with that "deer in the headlights" look on your face just stand there. Yes, I know, if the situation is not covered in your officially approved handbook, you're just going to stand there until kingdom come or someone else makes the decision to walk around you. Or, if I'm the obstacle - punch you in the face. And yes, I do realize I just insulted about 12 million people, give or take a few hundred thousand. Feel free to return the favor, I can take it. Yet in many ways, I am always amazed when I visit Tokyo. The city is so diverse, international and cosmopolitan it makes my provincial head spin. There are foreigners on every corner and in every subway car (and I'm not talking about Asakusa here). A multitude of foreign languages can be heard on the streets (and not only in Asakusa). And even the native sheeple seem to be able to express themselves in English (though maybe only in Asakusa). Ah, Tokyo... I hope I won't have to visit there again until at least May. 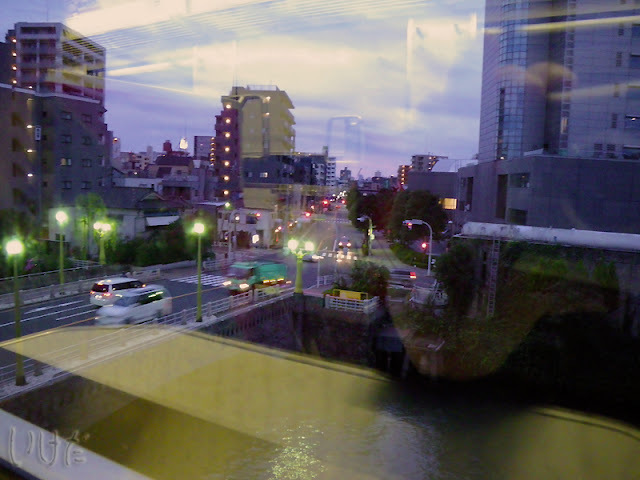 Taken from the train (Tobu line approaching Asakusa, I think).